If you haven’t taken the leap into Geographic Information Systems (GIS) yet, maybe you’re wondering why you need it or what you would do with it. Whether the maps are for locating and managing your city’s information – be it underground utilities or actual roadways – or to visualize property boundaries, a GIS-based map is the best way to show your city’s information in a straight-cut, interactive way. Today, we’re sharing our “Top 5 GIS Benefits for Your City” to show you where the rubber meets the road; this mapping software gives you the power to visualize and interact with information. GIS allows you to see and sort the infrastructure and utilities that lie beneath a city’s streets, curbs and sidewalks. A typical utility map that shows sewer, water and storm infrastructure doesn’t have a lot of background information displayed other than pipe size and type. GIS maps have much more information tied to these utilities, like the age of material and past maintenance records. This makes it easier to track and manage that infrastructure. Asset management also helps you concretely track small details, like the exact location and frequency of water main breaks, making it a valuable tool in helping you assess your overall system. City officials and land owners generally have a handle on who owns which pieces of property, but exact boundaries sometimes aren’t adequately marked or clearly defined, particularly in smaller towns. GIS can create a geographically precise parcel map using legal documents and plats to correctly display ownership. Better access to information allows more informed decisions. 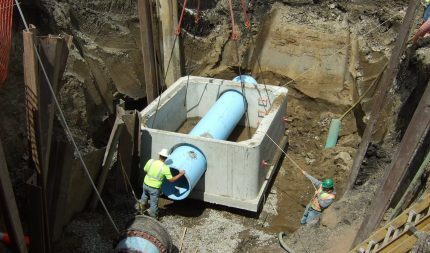 Knowing the age or type of pipe, for example, can help define the schedule and scope of a possible replacement project, so parts of town with significantly older pipe can be prioritized. GIS allows you to tie in a virtually unlimited amount of data to your city – record drawings, curb stops, section corner tie offs, maintenance records, and on it goes. It’s all in one place, and all tied to a map. As an information management system, GIS is exceptionally good at tracking changes in your information and applying it in real time to your displays. People are visual creatures. Intuitive, clear displays are enormously effective for decision making processes. GIS allows you to show all the layers of data you need at once, in a clean format. GIS is transforming the way cities manage their assets, serve their residents and make community decisions. Have you considered applying the power of GIS to your city map? Give us a call to talk about how GIS can make a difference in your city.